The Barbie® Fashion Model Collection is the most prestigious line of Barbie® dolls cast in Silkstone® material. 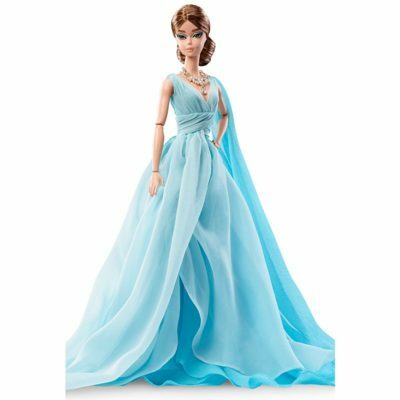 The BFMC program celebrates the glamorous style and heritage of Barbie® featuring intricately crafted and beautifully tailored clothing, highly detailed jewelry and accessories and the original 1959 Barbie® face sculpt. Inspired by the timeless designs from premier haute couture fashion houses of yesteryear, Barbie® wears an ethereal lavender organza and tulle mermaid gown adorned with intricate beadwork and shimmering sequins. Her flaming red hair is styled in glamorous waves and her silvery eye makeup complements her gorgeous gown. Finishing touches include rhinestone chandelier earrings, silky charmeuse opera-length gloves, a lattice-cuff bracelet and slingback heels. Includes doll stand and Certificate of Authenticity. Each doll sold separately, . Colors and decorations may vary. Doll cannot stand alone without stand and may not be able to hold accessories as shown. From the 2015 Barbie Fashion Model Collection.